I personally had no beef with them being there that early with us. However, it did grate on my nerves that they seemed to show absolutely no reverence for the place. 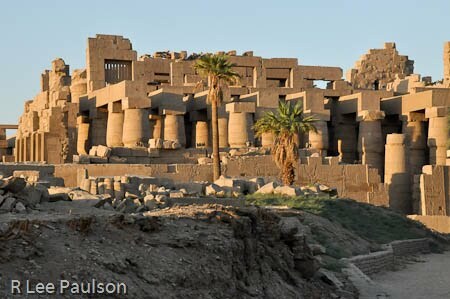 This was one of the most important temple complexes in all of ancient Egypt. Would it hurt to show it a little respect and keep the voices down? 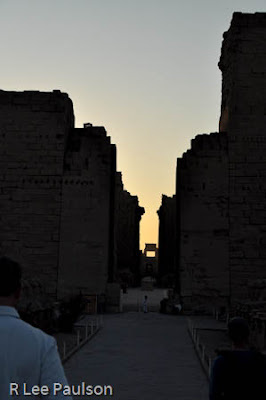 You can't see it here very well as we look through the shadows at the sunrise, but we enter between a long row of sphinx's which have ram's heads. They can be seen if one looks closely, just to the right of the man's head in the photo above. looked up a moment later and saw light from the newly risen sun visible through these 'windows' in the huge outer pylon. 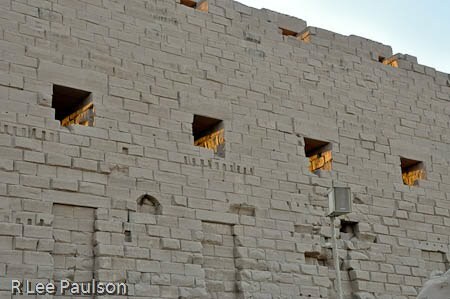 West says that this temple was constantly being worked on during most of Egypt's history, with parts being torn down, rebuilt, and revised at any given moment. Oddly enough, this huge outer pylon was one of the last structures built. Once again, there is no way to capture the flavor of this place with only a few photographs. It's too big, and there are too many different views. Fortunately for us, the loud tour group went one direction once we entered and we went another. This place had wonderful energy to it, even after all these years. West set us all free for an hour, while it was still relatively quiet. He encouraged us to be still with the energy of the place and allow ourselves to go where our noses and our instincts led us. This time, I was careful with my camera settings and managed to get some nice shots while I explored. It had grand hypostyle halls with large impressive columns, rows of them. 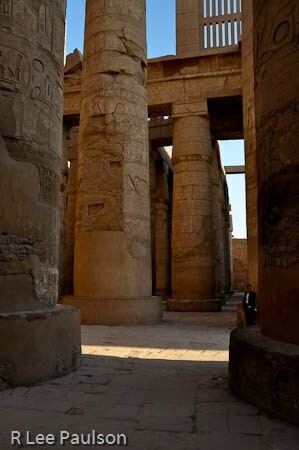 So many columns that it was easy to get lost among them. 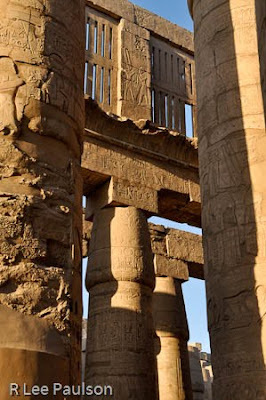 Here we can see some of the reconstruction of the columns. Still, notice the fine stone work on the lattice on the top. Notice also that nearly every square inch of original stone is covered with hieroglyphics. I also found intimate enclosures like this one with it's well worn steps. I couldn't help but wonder what this part of the temple was used for. 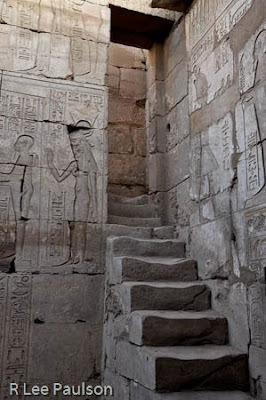 Notice the figure of the woman carved into the wall, just to the left of the stairs. Notice how her face has been defaced. But, only her face. We have no idea why they did this, or when. This was yet another court yard that has not been fully restored. Notice all of the red granite statues lying around. All that red granite, as you probably know by now, had to be transported down the Nile 300 or so miles from Aswan. ...turned around and looked back. 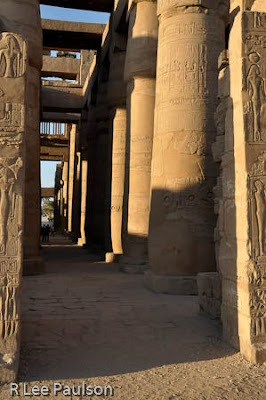 One can see some of the columns from the hypostyle hall in the top left of the photo here. The tall chunk of red granite in front of us to the right, partially obscured by shadow, is Hatshepsut's obelisk. At 97 feet high, and weighing 320 tons or so, this was the second highest obelisk placed by the ancients in Egypt. 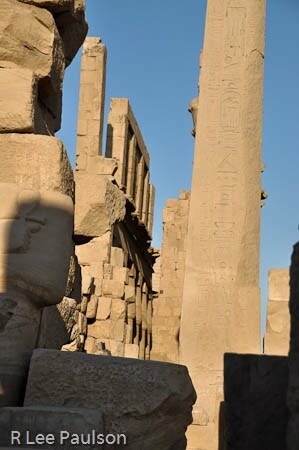 Originally, there were 7 of these huge obelisks in and around this temple complex. Red granite, I think I've already mentioned, has marvelous sound properties. One can tap the point of an obelisk like this and the entire piece of stone rings like a bell. The pair to this, on the other side of the main corridor, had fallen over. 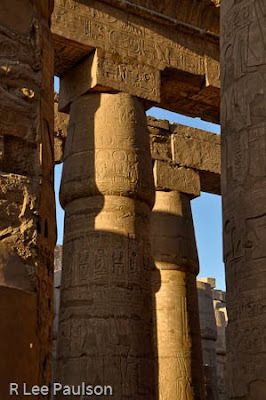 I believe the ancients used these obelisks as large versions of tuning forks, to set the vibratory 'tone', if you will, for the entire temple complex. I'll have another shot of this obelisk in the next post. 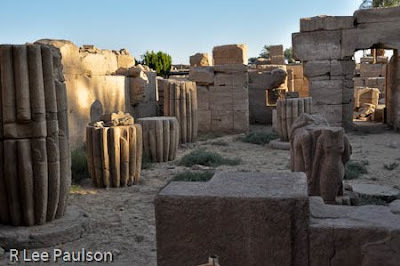 Next time, more images from Karnak Temple. Continue on to Post 31: Karnak Temple II by clicking here.